Hamiltonian systems are a very important class of dynamical systems. The Simple Pendulum is a well-known example. In general, the motion of Hamiltonian systems is very complex, but seems to fall into three classes: integrable, chaotic, and mixed. The double pendulum is an example of a dynamical system that can exhibit chaotic behavior. This system consists of two point masses $m_1$ and $m_2$, suspended by rigid weightless rods of lengths $L_1$ and $L_2$, respectively. (An analytical treatment of this problem is given here.) Because there is no friction, this system is clearly an example of a Hamiltonian system. Neumann, Erik. "Double Pendulum Physics Simulation." My Physics Lab. This program solves the coupled equations of motion of a double pendulum to simulate chaos for large amplitude oscillations. For small angles, this system behaves linearly. 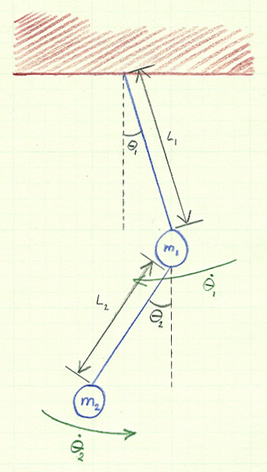 However, for large angles, the double pendulum becomes non-linear. This non-linearity is displayed in the phase space plot above for the generalized coordinates $\theta_1$ and $\theta_2$, and is referred to as a Lissajous curve because the motion of this system is determined by sine and cosine functions. Like many dynamical systems, it is highly sensitive to initial conditions, making it chaotic.